Just when I think I’m doing fine with my father’s death, I get hit with sadness. Little things trigger some rough days. I’ll listen to German music that I couldn’t appreciate in my teen years. I start singing along and the tears just start. I don’t want to cry. It just happens. Wonderful things also happen to trigger genuine joy and happiness and not tears. Fishburne Military School invited my husband and me to teach cadets some basic ballroom dance steps for an upcoming ball. We’ve been out of practice for a while and just recently started dancing again. We demonstrated a few dances and taught these young men a few steps. I was in awe of how serious these young men were. It wasn’t teaching for me. Dancing is my passion. What a pleasure to be able to share it with a younger generation. You can’t really be sad when Glen Miller’s “In the Mood” starts to play. It’s East Coast Swing and your feet just start moving. After practice, I came home happy. I haven’t been so happy in a long time. Dance, music and young people; I had been given a gift of happiness. My father enjoyed music and liked to dance. Ever since I can remember, he was the first and last one on the dance floor. 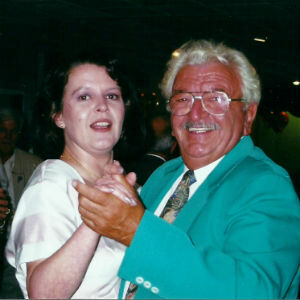 He even took formal dance classes in his late seventies. My father also loved Fishburne Military School and the Corps. “Those are good boys. All of them. They just need a little discipline and the school gives them that,” he told me many times when he visited while my husband and I were employed at Fishburne. “I don’t know, Pop. We’ve got some rough ones,” I told him. Well, he had a point. Those “rough” ones have turned into successful men. And, I was a “challenging” teenager. Ok! My husband claims I’m still challenging! What a wave of happiness: good memories, music, dance, and a school. If my father were alive, he’d be right there with us. That’s when it hit me. Why am I wallowing in sadness? Didn’t my father teach me how to appreciate music, dance, and youth? Wouldn’t he want me to enjoy this music and dance with the Corps? I danced with my father on many occasions. I dance with my husband. This weekend I’ll be dancing more. From now on, when I feel my tears start, I’ll just play some ballroom music and dance. If my husband is here, I’ll dance with him. If not, I’ll dance by myself. But, I’ll dance. I’ll dance my tears away. My healing journey continues. Join me. Let’s dance.